Hey Penguins! 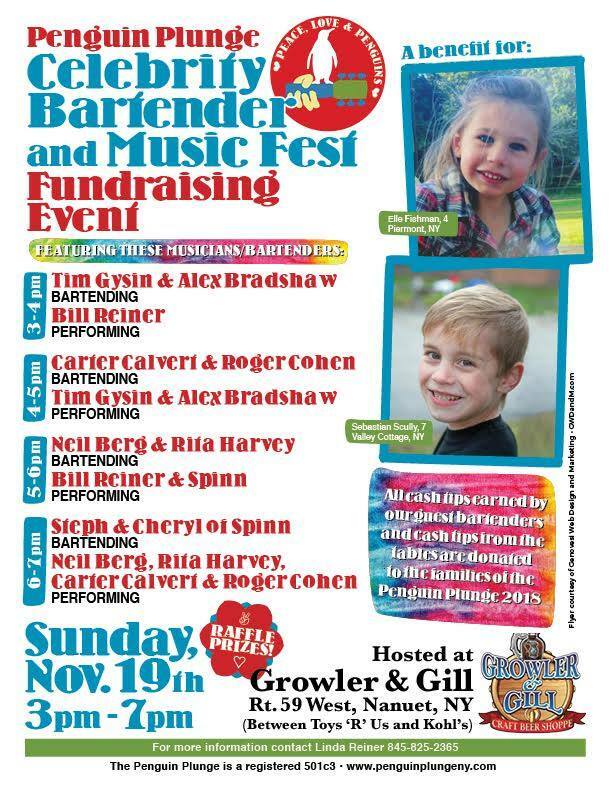 As you may know, our Celebrity Guest Bartender event is this Sunday, November 19th at Growler and Gill, and The Penguin Plunge would like to provide you with a little sneak peak of the talent that we will be bringing this year! Neil Berg ~ Composer, Lyricist, Producer for Broadway/Off Broadway and Films. Rita made her Broadway debut performing the lead role of Christine Daee in "The Phantom of the Opera,” after two and a half years performing the role with the second national tour. She performed on Broadway in the role of Hodel in the latest revival of "Fiddler on the Roof," directed by David Leveaux and starring Rosie O'Donnell and Harvey Fierstein and Alfred Molina. Rita is the principle soprano in Neil Berg's “100 Years of Broadway," which was voted the number one touring concert in the country. Her wonderful new show, 'Heart Like A Wheel' - A Tribute to the Music of Linda Ronstadt, celebrates one of the most beloved and versatile pop singers of the past five decades. Rita is married to Broadway composer Neil Berg, and they have a wonderful, talented 12 year old son, Lucas Berg. The full version of Rita’s bio can be found on her website, Ritaharvey.com. Roger Cohen ~ Musician, Drummer/Percussionist – Carter Calvert & the Roger Cohen Trio. This past year Roger has been touring the globe with his wife, Carter Calvert, as a headliner duo on the prestigious 6-Star Crystal Cruise Line as well headlining in clubs and theaters across the country. Their CD “Carter Calvert & the Roger Cohen Trio” debuted at #13 on the CMJ National Jazz charts. It garnered rave reviews & received National radio play (their CD is available on Cdbaby & iTunes). Roger also performs nationally and internationally with Neil Berg's 100 Years of Broadway. Roger's credits include Martin Short, Rita Moreno, Audra McDonald, Sally Struthers, & Sir Cliff Richard. He has also worked with progressive rock superstars James Labrie and Jordan Rudess (Dream Theater). He is also the drummer for Rob Evan who is the lead singer for Trans-Siberian Orchestra. Roger’s original rock band, Cruel Season, released their debut album on Dark Star records last year. He is very proud of his role as mentor in the Big Brother Big Sisters program (BBBS.org). Roger and his wife Carter and 11-year old daughter, Ella live in Westchester County, NY. SPINN ~ Stephanie & Cheryl Spinner ~ Alternative Country. Tim is a 22 year old piano player and singer from Bergen County New Jersey. He started playing piano when he was just two years old and started singing when he was 12. Aside from piano, he also plays bass guitar, acoustic guitar, drums, harmonica, saxophone, and ukulele. Tim performs solo or in bands such as The Iron Rail Band, My Buddy Paul, and The Tim Gysin Trio. He performs around 300 shows each year at local restaurants and bars, weddings, private functions, and town events playing by artists such as Billy Joel, Elton John, The Beatles, Hall and Oats, Ed Sheeran, Bruno Mars, Pink, Lady Gaga, and more. You can find Tim on any social media platform or on his website at TimGysinMusic.com. Alex Bradshaw ~ Singer-Songwriter, Guitarist – Smash Jackson. Alex is a singer-songwriter for a new project “Smash Jackson” with his songwriting partner Scott Barrett. He is from the pop rock New Jersey based band, Saturday Drive, and has been writing and playing music for the band since their first release “EP Start It Up” five years ago. Check out Alex’s music on his FaceBook page and on YouTube: AlexBradshawMusic & SaturdayDriveMusic. Each of our performers/bartenders are Rockland, Westchester and Bergen County residents who perform locally, nationally, and internationally. They are so excited to help out these children in their community! Come on down and join us for our Sunday Funday for a good cause!